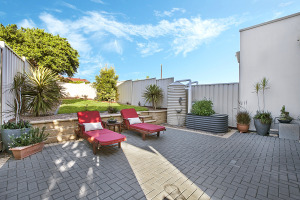 This Christies Beach house is a spacious modern four bedroom townhouse with all the appliances and services required for a luxury short or long term stay. The beautiful sand of Christies Beach is only 100 metres from the house’s front door. The child-friendly beach is directly adjacent to, and serviced by, the local Life Saving and Sailing clubs. Nearby Port Noarlunga with its many cafes, restaurants and historic jetty is only a few minutes drive, or for those looking to stay fit, a very pleasant 15-20 minute walk along the coastline. A special feature is the upstairs balcony with ocean views and remote-controlled blinds to take the heat out of the late afternoon sun while you relax and enjoy pre-dinner drinks and nibbles or look after the steaks on the gas barbecue. All bookings require a Security Bond, are subject to our terms and conditions and are not confirmed until approved by the owners. Phone enquiries can be made by calling 0419 529 869. 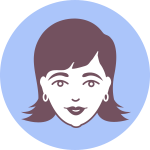 Click here to make an online booking request. This property is a spacious modern four bedroom townhouse with all the appliances and services required for a luxury short or long term stay. 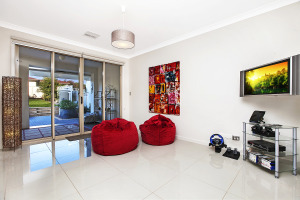 There is a large open plan Lounge/Dining area including a 52" Sony flat screen LCD TV with Foxtel channels, Blu-Ray disc player and Bose surround sound system. Fully-equipped kitchen with gas cooktop, electric oven, 2-door fridge/freezer, dishwasher, filtered water system, pantry and extensive food preparation area. Upstairs you will find bedroom 1 - King bed, ensuite and dressing area; bedroom 2/single bed and port-a-cot available on request; the guest toilet/vanity and a spacious balcony with gas barbecue. Downstairs there is an additional family-oriented area with 36" Sharp flat screen LCD TV, DVD player and Playstation (perfect for the younger generation). You will find bedroom 3 - Queen bed and built-in robes; bedroom 4 - single size bunk beds and built-in robes; a large family Bathroom with bath and separate shower; a separate Toilet with adjacent vanity area; the laundry with washing machine and separate dryer; an imposing entry hall and the two car lock-up Garage with direct secure access to the house. At the rear of the house there is a private and secure garden area with a hot/cold shower facility to wash off the salt/sand after a day at the beach. Also, a tiled undercover area (with cafe-style blinds) provides another place for the family to relax or play in inclement weather. Reverse cycle airconditioning services all areas in the house to provide zoned temperature control throughout the year. Free wireless internet is available. All linen and towels are supplied. Pets are allowed but limited to small dogs only. Excellent and Beautiful. 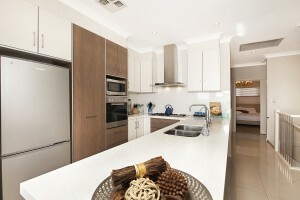 This property is beautiful and very well equipped with everything we needed for our long weekend stay. We loved every minute. With the beach just as short walk away we watched two beautiful sunsets from the beach. The view from the balcony was also amazing. Thank you Sally we had a lovely time and you will definitely see us again!!! Perfect! Close to the beach, with beautiful view of the sea. Less than a minutes drive to shopping, cafes. Convenient auto-roller door for our car. A place you could easily spend just sitting on the balcony for hours on end doing nothing but enjoying a good bottle of wine. Our only regret is we couldn’t stay longer! Highly recommended. Will definitely stay there again, but longer next time. Absolutely AMAZING. 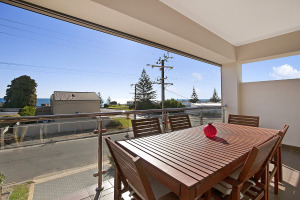 The location is perfect, one street back from the esplanade, the beach views allow you to experience spectacular sunsets on the balcony while cooking a simple BBQ & enjoying a glass of wine. It really doesn’t get any better than this holiday rental & we highly recommend this property to anyone looking for a holiday rental in this area. We stayed here for 8 days Dec2013/Jan2014 & absolutely LOVED it. The townhouse is not only gorgeous in every way, it is in the perfect location & has absolutely EVERYTHING you could need or want, you find all the little “attention to detail” touches in every room in the house.